CyberLink has released PowerDirector 15, the latest version of its flagship video editor that features impressive technology powering advanced editing features, yet still with a smart design that is approachable even for casual editors. 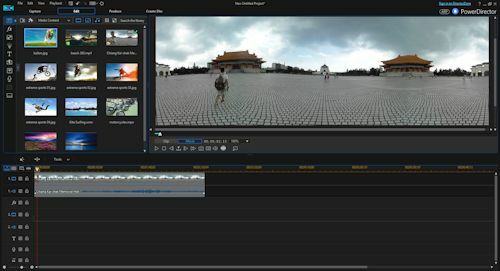 Like the recent new release of Pinnacle Studio 20 (see earlier post), PowerDirector version 15 features end-to-end support for editing 360-degree video (aka immersive or spherical or VR videos). CyberLink is enthusiastic about the prospects for 360-degree video, expecting that it will quickly become ubiquitous in action cams, helping to drive demand for PC-based editing of user-generated 360 videos. 360-degree support is deeply embedded in PowerDirector, for importing equirectangular footage from various cameras, creating a 360 project, editing with a full range of tools, adding titles, effects, transitions, and animations, and then exporting in 360 format. PowerDirector also has the True360 View Designer to export from 360 to standard video by dynamically panning the field of view in 360 footage, and then outputting the result as a standard (2-D) video file. And CyberLink has extended 360-degree support across its suite of tools, including color grading of entire 360 scenes in ColorDirector 5 and 360 editing of action cam footage in ActionDirector 2. Beyond the 360 video, there's more interesting new stuff in PowerDirector 15, including a built-in mask designer for quickly adding transparency to text and images, and video blending to merge clips on different timelines. The built-in Action Cam Center also adds stop-motion and pan/zoom effects to other quick tools for action cam footage. Another smart addition is a design mode for vertical video, so you can edit upright video shot on mobile phones (in portrait orientation), and then upload directly to social media sites. Plus CyberLink has leveraged its TrueTheater Color technology from PowerDVD, to intelligently analyze footage and optimize hues and vibrancy for a cinematic appearance, while protecting skin tone. PowerDirector also now supports round-trip editing with ColorDirector, in addition to AudioDirector, so you can apply color grading or audio effects without needing to export or re-import tracks. You can download 30-day trial versions of the new PowerDirector 15, or even the full Director Suite 5 to try out. CyberLink also has extensive online tutorials, including importing 360 video from a variety of cameras. It also is running a free webinar on Introducing PowerDirector 15 & PhotoDirector 8 on Sept. 26 and 27. Entries posted to Manifest Tech Blog in September 2016, listed from oldest to newest.